Have you ever experience the other side of this coin? Have you ever gone fishing when the fishing is red hot only to experience mediocre action that rebounds right back to red hot the day after your trip? Of course you haven’t, consistently good fishing just doesn’t take a one day dip for no reason and then rebound….Right? Well actually it can and I felt the pain of just such a shift of fortunes last week. The trip came to life last January at the Sacramento ISE Show when I set up a March Cal Kellogg School Of Fishing sturgeon and striper combo trip to take place in the West Delta with Captains Hayden and Stacy Mullins of Dragon Sportfishing. When Stacy and I set the date for the trip, we figured the fishing would be productive. The tide looked good and the fishing is usually heating up in the West Delta during the month of March. As January gave way to February, Hayden started putting his client on big stripers. Not fish in the teens, but rather really big bass in the 25 to 40 pound class! As the weeks went by and the date for my trip got closer the fishing did nothing but improve for Hayden and team with bass in the high 20’s and 30’s hitting the deck daily. In fact, during the three trips before my March 8, School of Fishing adventure, 4 fish over 30 pounds were landed aboard the Dragon. You can never count big fish before they are actually landed, but I’ll admit that visions of huge bass being caught on video were dancing in my mind as I made the two plus hour pre-dawn drive to the Pittsburg Marina on the 8th. The conditions looked perfect. As small low pressure area was moving in late in the day, so I figured the bite would be good. 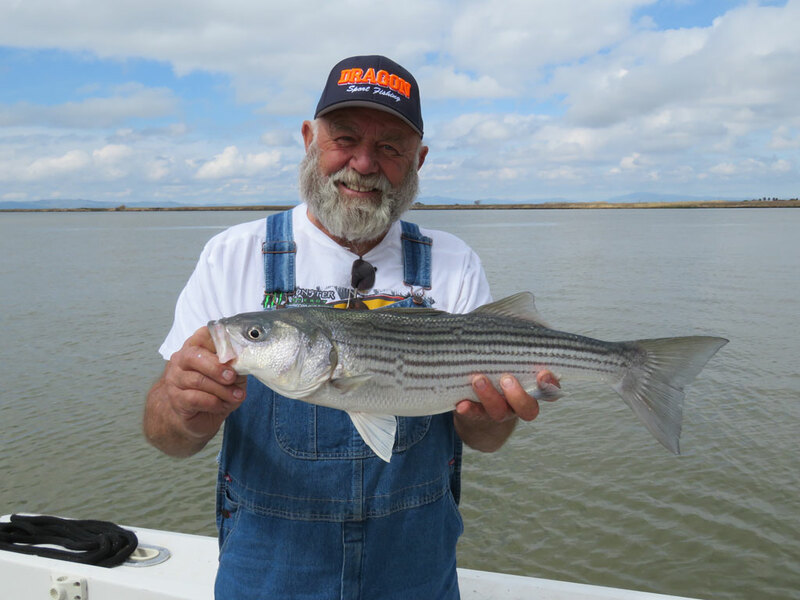 Heck I’ve had wide open striper fishing in the West Delta while fishing the leading edge of a low pressure area. Hayden had told me and our six anglers to show up at the Pittsburg Marina at 6:45 in the morning, but of course most of us were early. We all chatted in the parking lot for a while and then made our way past the fuel dock to Hayden’s impressive yacht. After introductions, we stowed our gear, Zack our deckhand untied the lines and Hayden steer the huge boat beyond the breakwater and into Suisun Bay. The run to the fishing grounds wasn’t long, or complicated or even secretive. We hadn’t cruised far when the screen of the Furuno started registering an array of marks from fish that looked to range from big to downright huge. “Some of those fish are sturgeon, but a lot of them are stripers. We’ll concentrate on stripers, but we’ll have a sturgeon rod in the water just in case,” Hayden told me as Zack lowered the anchor. With the anchor holding and the final push of the incoming tide underway, Hayden and Zack baited 6 rods with large live and dead baits for stripers and a seventh rod was baited with a spawn sack filled with salmon roe for sturgeon. The best fishing for stripers and sturgeon typically takes place at the beginning and ends of the tides and we hoped to convert one of those big marks we’d seen on the sonar into a big hookup! But alas our hopes and dreams were crushed during the remainder of the incoming tide when we didn’t get so much as a nibble. “Oh well,” I thought. “I’ve had better luck on the outgoing tide”. During slack water Hayden moved down to Honker Bay and repositioned the boat. Back into the water went the baits. An hour passed and then another. We had a few pecks and bumps, but nothing you could really call a bite. When the drifting weeds started to get really annoying, we were on the move again to get away from the salad and to find a good spot for the second half of the outgoing tide. “When the bite came on Merle’s rod it was very light to begin with. The reel was out of gear and the fish moved off slowly playing with the bait. The fish seemed sluggish, but eventually the bass picked up speed and the hook sunk home…Fish On! Merle’s 7 pound striper wasn’t the monster we were looking for, but at least we were on the score board. Better still, Merle’s bass was barely in the box when Brad Schmidt’s rod got hit. Brad’s fish also moved away slowly, but eventually got serious and took off. Again we were hoping for a double digit trophy, but it wasn’t meant to be. Brad’s striper was a hair bigger than Merle’s fish. At this point it seemed like we were in the grove, but as quickly as the fish started biting they stopped and Brad’s bass was the last fish of the day. I’d gotten some decent video, but not of the monster bass I hoped to capture. Both Brad and Merle earned rod and reel combos courtesy of Diawa and Okuma. Fast forward to the next day and I started getting text messages from Hayden early in the morning. Of course, the big fish action was back on track with bass weighing 40, 31, 10 and 10 pounds coming aboard the Dragon…. Yes I should have been there yesterday, I mean tomorrow…Well actually I should have been there pretty much any other day….LOL! 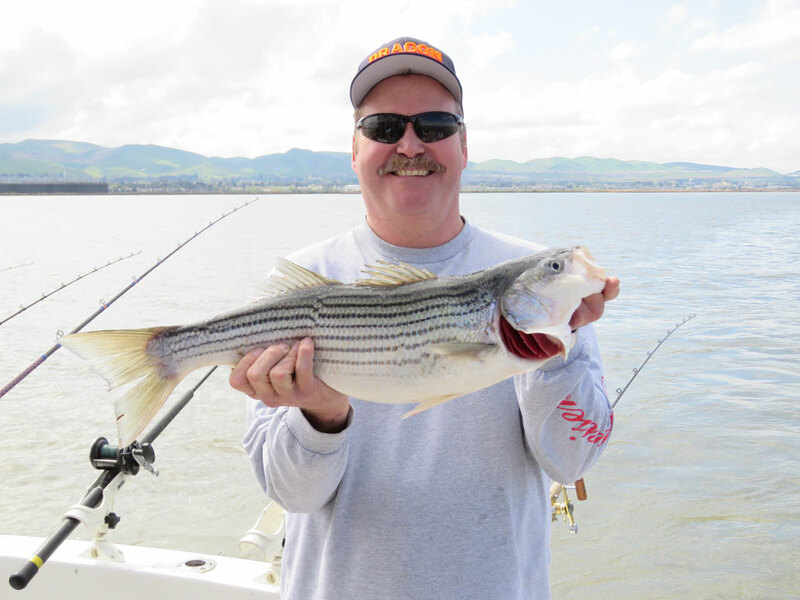 If you’d like to head out for trophy stripers and sturgeon, give Captain Hayden Mullins a call at (925) 428-1103. Chances are if I’m not on the boat with my video camera, you’ll hook something huge!